#1. Don’t try to do too much at once. When you’re starting a business, it’s tempting to dive in with both feet and tackle ALL THE THINGS. There are so many areas we want to explore, tactics to pursue, and strategies to test. And it can feel like we need to start everything, all at once, as to not waste any time. The reality is that working on too many disparate things at once can not only lead to burn out, but it hinders your ability to do any one thing well. You can end up spreading yourself so thin that you’re doing only a mediocre job on five things versus a really good job on one or two. Then, focus on your most important tasks every week, being mindful to not get distracted by other opportunities or ideas that come up. This will help you work deliberately, getting the most critical things done, and bettering your chances of success. #2. Try not to be too hard on yourself. There’s something about entrepreneurship that brings up a lot of self reflection and can cause us to doubt ourselves. Did we really make the right choice pursuing this venture? Do we have what it takes to be “successful”? Should we be working harder, smarter, or doing things differently? This is something I experience often, and it doesn’t seem to ever go away, despite the months passing. I’ve learned that when these moments of doubt strike, it’s important to give yourself grace and acknowledge how far you’ve come. Being hard on yourself will only slow you down and cloud your judgment. Instead, let yourself feel your feelings, but then remind yourself of why you started this business in the first place, what you’ve accomplished, and how it all fits into the bigger picture. My post How to Weather the Problems Faced by Entrepreneurs shares more insight around the mindset side of entrepreneurship. And if you’re in need of some self care, my post The Ultimate Daily Self Care Checklist (Download for Free!) is a good starting point. Like I mentioned above, as an entrepreneur, there are so many things you could be doing at any one time. You can easily fill your days working and being “productive”, though you may not be working on the right things and in the right order. To ensure your work is deliberate and strategic, I’d recommend setting some type of plan, whether it be a formal annual business plan or something more short-term like a 12 Week Plan, based on the book The 12 Week Year by Brian P. Moran and Michael Lennington. I’ve been planning in 12 week cycles for the past few months, and it’s transformed my productivity. I’m now focusing on the right things every week, and I always know what I should be working on. It’s given me a lot of clarity and direction. For more on planning in 12 week cycles check out my post How to Create a 12 Week Plan That Will Rock Your Goals. #4. Take some time off. What – vacation?! It can seem like a foreign concept when you’re self employed or running your own business. But even just allowing yourself a long weekend here and there can make a world of difference. The key is to not get burnt out, and to keep your mind fresh. If taking a day or two off aren’t in the cards, try at the very least to take some breaks in your day. Don’t work through lunch. Go for a walk or work out in the middle of your work day. The key is to give yourself some space away from your business. Once of the most challenging aspects of entrepreneurship is patience. We want to achieve our goals, and we want to achieve them now. We don’t want to fail, learn, or overhaul. And we don’t want to wait for that validation that we made the right choice in pursuing our dreams. So how, then, do we deal with the inevitable ups and downs? One of the greatest tools I’ve found is to believe in consistency. Success is driven by consistent, forward-moving action taken day by day and step by step. It’s not an overnight change or snap of the fingers that will propel you to greatness. This may seem easier said than done, but by staying focused on your day-to-day tasks and the consistent action you need to take, you’ll be in much better shape to handle the obstacles. 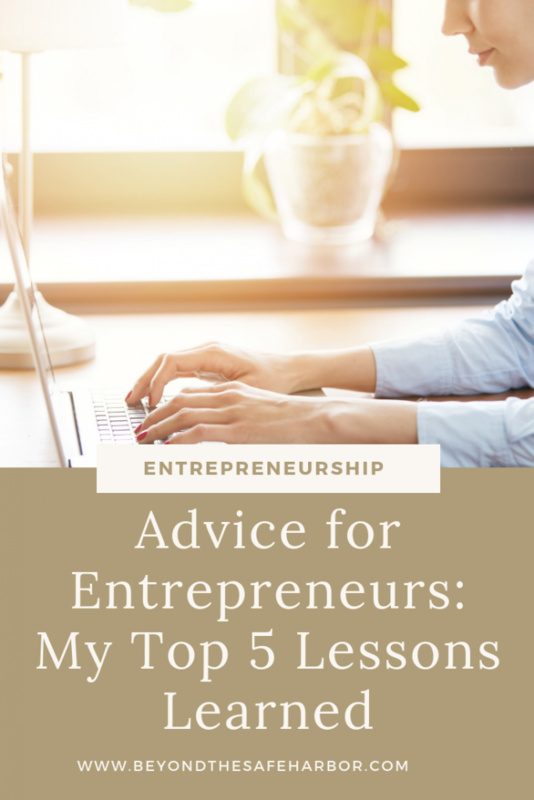 Those are my top lessons learned from my experience as an entrepreneur. If you’ve started your own business, what have you learned? I’d love to hear it! Let me know in the Comments below.